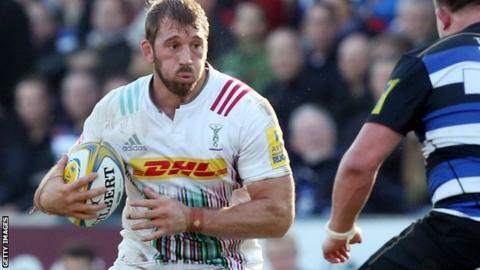 England captain Chris Robshaw made a winning return for Harlequins as they produced a stunning second-half performance to defeat Bath. Bath led 13-12 at the break through Kyle Eastmond's converted try and two George Ford penalties, with Nick Evans kicking all Quins' points. Danny Care and Dave Ward then crossed for Quins, with Evans converting both and adding four more penalties. Nick Auterac and Semesa Rokoduguni scored late consolation tries for Bath. But those scores, plus a conversion and penalty from the boot of Ford, were too little too late as Bath suffered successive defeats in the Premiership, while Quins made it two wins from three games. Bath led at the break through Ford's penalty on the stroke of half-time, with the only try in the opening 40 minutes coming from Eastmond, while Evans kept the scoreboard ticking over for Harlequins with four penalties. But Conor O'Shea's side stunned last season's Premiership finalists in 20 second-half minutes, with first Care finishing off a fine individual try which Evans converted, while the Kiwi also kicked a further four penalties. The hosts could only contribute two Ford penalties in that time, and Ward's try four minutes from time compounded their misery. Auterac bundled over from a driving maul and Rokoduguni finished well in the corner - but it made no difference to the outcome. "We're totally gutted about the performance, especially the discipline side of it. "They took their opportunities. But I was disappointed that we compounded things. We conceded two tries - but eight kickable penalties. We couldn't get out of the rut. "It's a good wake-up call, if we needed one. We obviously did. Everyone of us - coaches included - need to go away and think about our role in this defeat today and see how we can get better." "I thought he really grew into the game. He was blowing a bit but he was outstanding. He will prove himself again as the best back row in England. I have no doubt about that. "Whether people want to make him captain or not, I don't care. "He is an unbelievable rugby player. I feel for him, the stick he has got has been completely unwarranted. But that's the world you live in if you stick your head above the parapet as England captain." Bath: Watson; Rokoduguni, Devoto, Eastmond, Banahan; Ford, Matawalu; Lahiff, Webber, Wilson, Day, Attwood (capt), Garvey, Mercer, Houston. Replacements: Batty, Auterac, Thomas, Hooper, Northcote-Green, Cook, Priestland, Homer. Harlequins: Brown; Yarde, Lowe, Sloan, Visser; Evans, Care (capt); Marler, Gray, Jones, Horwill, Twomey, Clifford, Robshaw, Easter. Replacements: Ward, Lambert, Sinckler, Matthews, Wallace, Dickson, Botica, Lindsay-Hague.